The Star's boxing writer and head of sport Bob Westerdale says he can “only see one winner” this Saturday night when Sheffield's Kell Brook takes on Canadian challenger Kevin Bizier. Westerdale, explaining that Bizier will be hit by what Brook terms his “chocolate brownie”, says the fight “will all be over by round six”. He said: “I don't think it'll go anything like the distance. I've seen [Bizier] on YouTube, dancing round, sparring, and he doesn't look anything like the real deal”. Brook is currently seen as low as 1/50 to beat Bizier on numerous betting websites. Speaking about the action on the undercard, where South Yorkshire fighter Adam Etches is fighting, Westerdale said Etches is a “potent, explosive boxer” and an “outstanding talent”. 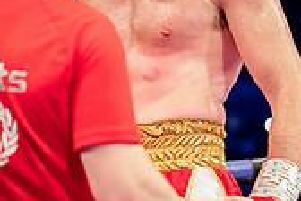 Doncaster's Dave Allen, also on the undercard, suffered disappointment when his bout with Sheffield boxer Richard Towers fell through because of a Towers illness. He now fights the American Jason Gavern.